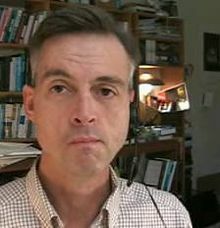 Robert Wright (born January 15, 1957) is an American journalist and author of best-selling books about science, evolutionary psychology, history and sociobiology. That biological evolution has an arrow -- the invention of more structurally and informationally complex forms of life -- and that this arrow points toward meaning, isn't, of course, proof of the existence of God. But it's more suggestive of divinity than an alternative world would: a world in which evolution had no direction, or a world with directional evolution but no consciousness. If more scientists appreciated the weirdness of consciousness -- understood that a world with sentience, hence without meaning, is exactly the world that a modern behavioral scientist should expect to exist -- then reality might inspire more awe than it does. Nonzero: The Logic of Human Destiny. New York: Pantheon Books, 2000, p. 323. The Evolution of God. New York: Little, Brown and Company, 2009, p. 286. This page was last edited on 16 January 2019, at 13:53.